You are currently browsing the tag archive for the ‘Elise Wagner’ tag. 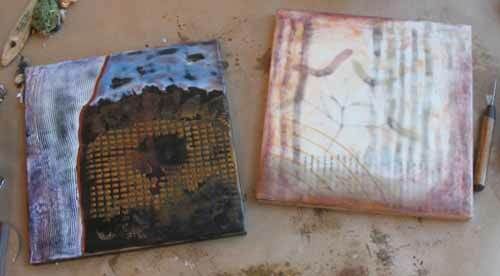 Here’s a video of a recent studio visit with my friend and fellow encaustic enthusiast Elise Wagner. 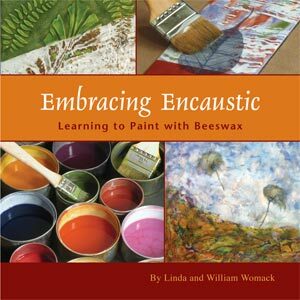 I say enthusiast because Elise not only paints with wax, she manufactures a terrific line of encaustic paints called Wagner Encaustics. 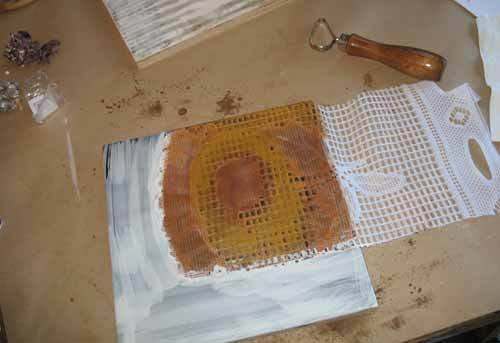 I use them when I paint — her yellow ochre is my favorite color — and students in my encaustic workshops love them too! This video was made by Eva Lake, who offers frequent peeks inside artist studios here in Portland, Oregon. You can see more of Eva’s excellent interviews here. This has been a very full month for me but thankfully I’ve still found time to enjoy some terrific art events my friends are participating in here in Portland. Take a look at what’s happening and try to get out to see these shows if you can. 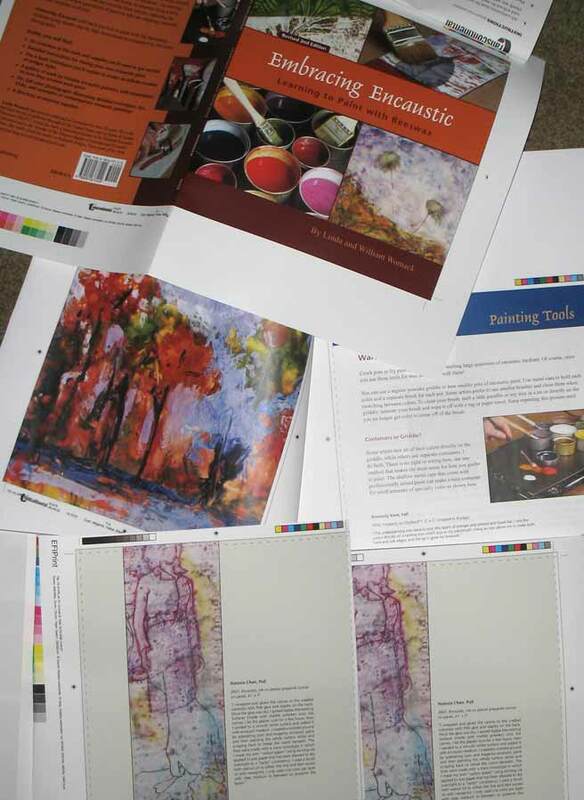 Lorna studied at the Otis/Parson Art Institute in L.A. California and received her B.F.A. from Cornish College of the Arts in Seattle. Washington. 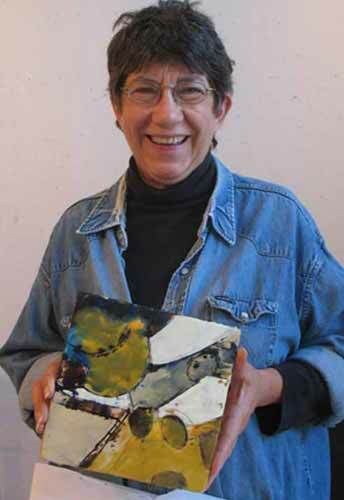 “My paintings are informed primarily by Abstract Expressionism. They occasionally touch on narrative through the use of subtle figurative imagery including houses, hands and lanterns. 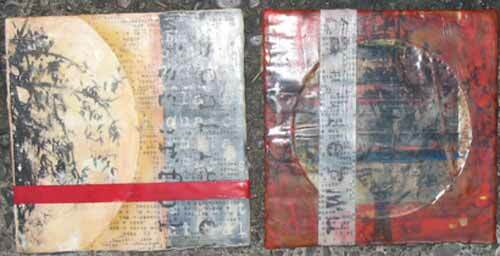 Imagery is hand-cut from paper or realistically painted then immersed in layers of resin.” Also showing: Susan Harlan, Kathleen Caprario. 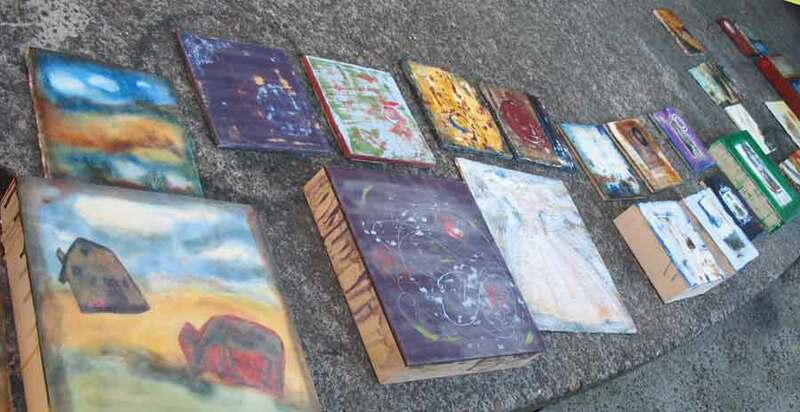 See Lorna’s work online. “Particle Maps” is Elise’s ongoing study of science in relation to art. 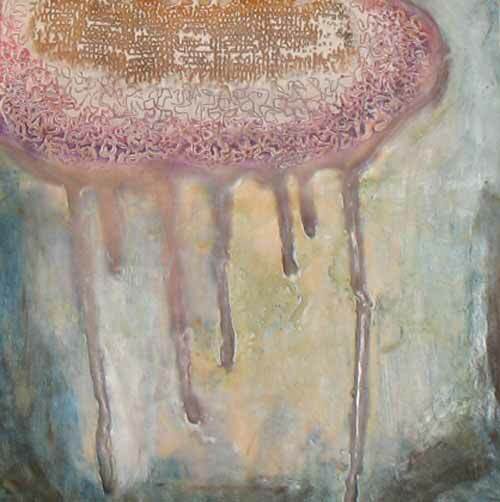 Her encaustic paintings evoke a celestial convergence of science and philosophy, an attempt to understand and connect. Also showing: Bernd Haussmann. 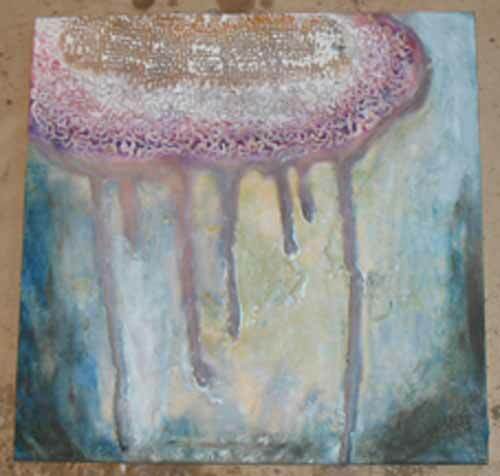 See Elise’s work online. Bridget’s shadowbox “Migration” was installed at the outdoor Mad50 art space just in time for the spring equinox. Designed specifically for this community art space at the corner of SE Madison and 50th, the piece is an exploration of home – what it means and how we find our way there. You can see more of Bridget’s work at CubeSpace (622 SE Grand Ave, Portland, OR) with an opening for the artist on March 28 from 6 – 8 pm. 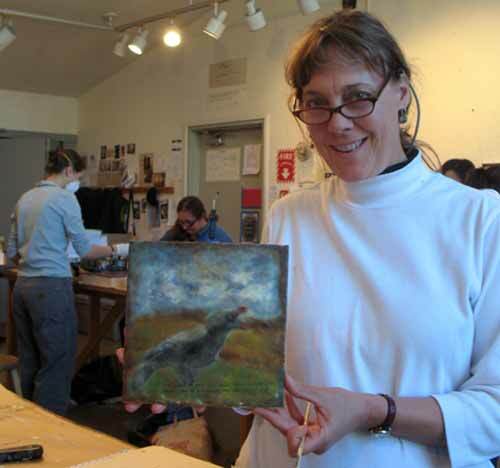 This weekend I was the teaching assistant for my friend, Elise Wagner, who taught an encaustic class at Oregon College of Art & Craft. We had a great group of all women (surprised?). 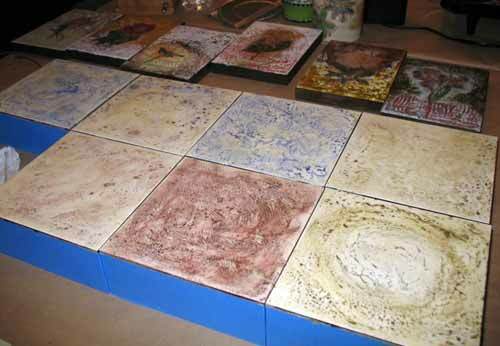 Why don’t more men take encaustic classes I wonder? In any case we had a wonderful time and everyone traded techniques and learned from one another. I spent a lot of the first day running down electrical problems, but I was still able to finish 3 little pieces. After all, I got an hour back this weekend so why not use it for art? I decided to try starting one painting with a black background and one with white. It was an interesting exercise as I had to think backward on the dark piece. If I decide to do it on a regular basis it will take some more practice! In the dark piece above I used a technique where you use lace as a stencil. 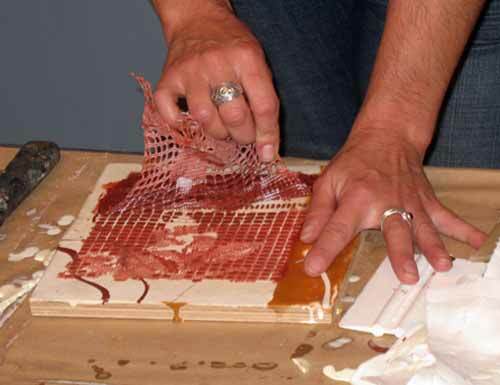 Just put the lace on your smooth wax surface and paint right through it. After painting, scrape off the extra wax, lightly fuse and pull the lace up before it gets too cool. Beautiful! 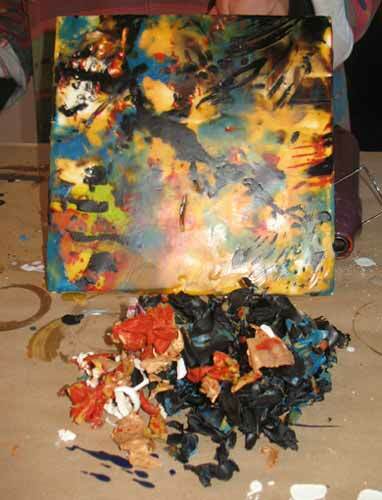 This is my third piece, made with the scrap wax shavings on my table toward the end of the day, then enhanced with R&F pigment sticks and soft pastels. The texture at the top of the cloud is from that same lace I had been working with above. There was still wax on it so I used an iron to release it onto my board for a sort of ghost print of the original impression. Libby went in a totally different direction, using pigment sticks on top of her wax to create a softer look. 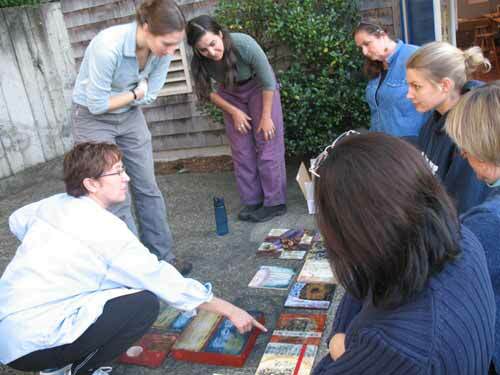 Erin took her work in yet another direction layering image transfers one atop another to create a spectacular effect. We had a quick critique at the end of the day. Everyone left happy and ready to wax on! To view the whole sketches category, go here. 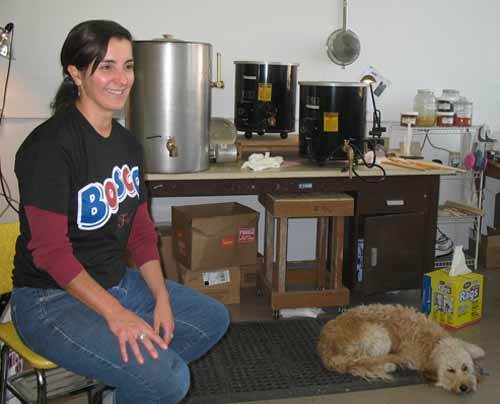 Here is Elise with her adorable dog Cleo in the mixing room. 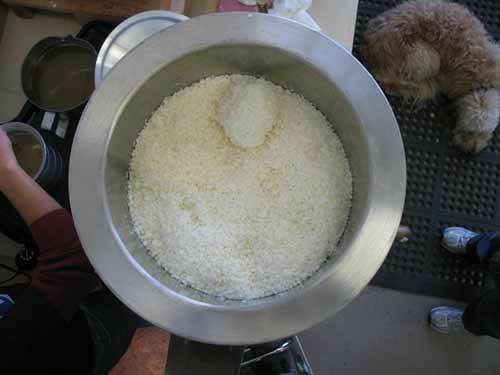 This is an overhead shot of the wax pastilles melting in the large black vat from the previous photo. This process takes many hours of patient attention to get the consistency just right. While the wax is melting Elise also heats her damar resin along with a little beeswax. Once this is combination is fully melted she’ll add it to the big vat of wax. 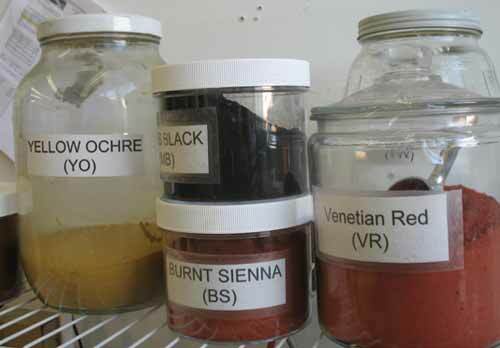 After the pigments are added the wax is poured into these handy ready to use containers and left to cool. (no more cat food cans!) These racks will fill up as the day goes on. 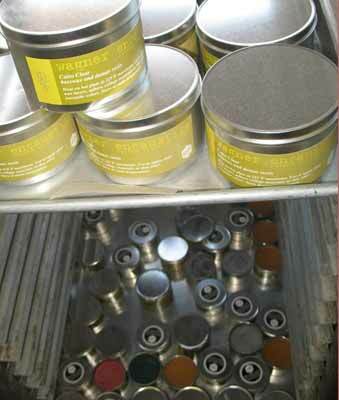 After cooling, the cans are cleaned, labeled and prepared for shipping.